Contemporary wine production, unlike traditional one, requires investments in certain technological equipment necessary for the production process itself. In order to assess the justification of the production improvement in this area, the application of the engineering economy methods is very suitable. Methods for evaluation of financial efficiency and improvement of alternatives have been used in this paper. Specific solutions and recommendations have been obtained. This article shows the method and results of experimental RESEARCHES of machines for egg sorting into categories based on size and form using a vision system. The principal difference of the considered machine for automatic sorting of eggs into categories from existing sorting machines is the division of eggs into categories by size and the separation of substandard eggs in the flow. Experimental verification showed that the machine provides the division of eggs in size into four categories and the separation of eggs of irregular shapes and sizes in the flow. The accuracy of separation of eggs into categories depending on the performance. With a productivity of up to two eggs per second, the accuracy of egg separation averages 94.8%., With a productivity of three eggs per second was 87.4%. A friction clutch is mechanical assemblies built between the engine and transmission, that with friction transfers torque from the driving part to the driven (working) part (engine gearbox and other transmission). A diaphragm spring is one of the key component of a clutch assembly. A diaphragm spring is piece to high stress concentration in driving condition, this is often the cause of cracks and crashes spring. The stress of a diaphragm spring is analyzed by finite element method, measurement of stress and performed compare to stress obtained by expressions on Almen-Laszlo. This paper deals with dynamic analysis of bridge crane with single girder in order to determine material deformations in their main parts – cables and girder’s, while moving and carrying load. It is known that these are mostly loaded parts in crane, while they accept forces, moments and oscillations from lifting mechanism and load. Analysis will be accomplished using computer modeling and simulations. Work process of crane in the study is forward travel motion. It is assumed that this motion process makes major impact in the deformations of lifting cables and girders due to stress, oscillations, and negative effect of load swinging. The analysis will be concentrated in finding the nature of oscillations that acts on crane and finding the extent and form of materials stress and deformations that can cause fatigue, failures and accidents. Question is whether acting loads exceed elasticity limits, or there are plasticity deformations which lead to permanent damages. Results will be shown in the form of diagrams, contour stress and strain in cables and girders. They will be compared with experimental measurements. Conclusions of these analyses can be useful for design considerations and safety. The investigation results of the production process of powder permeable materials (PPM) by forming thin permeable layers by means of ion-plasma sputtering method in a vacuum with the use of removable agents have been presented. The method makes it possible to obtain a continuous coating on the surface of the porous substrate. The layer formation on the surface of the porous substrate is provided by the use of the removable agent. After its removal, the layer sputtered on its surface remains an independent unit in the structure of the twolayer permeable material. The coating applied to the substrate has an open porosity. Incremental sheet metal forming has been well-known as one of the flexible methods of forming metallic sheets, suitable for the production of prototypes or small batch sizes. Apprehending the deformation method in forming processes and selection of route parameters to avoid part failure are of vital importance, because marketing needs standard sound parts in a shortest possible time. This paper presents the study on the use of finite element modeling of incremental sheet metal forming of Al 1100 aluminum alloy to investigate the effect of tool diameter and step over on the forming induced stresses, part thickness distribution and forming forces. The results of finite element analysis are compared with experimental data while producing truncated pyramid parts. It has been shown that the developed finite element model is capable of providing reliable results in the prediction of the final thickness of the part, which matches the experimental results with a maximum discrepancy of 8%. Nowadays are very actual problems of working out waste of non-ferrous metallurgy such as converter slags of the copper enterprise. One of the new direction of additional extraction of copper from slags of converter section is combine method including mechanochemical activation and concentration by flotation of nanostructured initial material. The first stage – is receiving thin crumbled material with high degree of dispersion. This permit furnish an explanation of noticeable changing of properties of high dispersion materials: appearance of activity centers on the surface of minerals because there are alterations and become activity of electronics structures of surfaces layers as consequence of modification of surface. Moreover, take places processes of opening of capsules, including captured particles of some components (metals, minerals from slag, such as copper sulphides etc.). As far as, converting is going with high speeds it’s possible mechanical capturing of initial particles which didn’t participate in interaction during of process converting, minerals may be screened by slag melt. Under the condition of the slowly cooling predominated kinetic mechanism of geterogenic interaction in the silicacontainig system. On the basis of investigations was worked out the technological regulations and fulfilled the industrial probation. In this study, microbial fuel cell’s energy conversion performance experimentally investigated from the chemical energy of the organic waste to electrical energy by means of microorganisms. Microbial fuel cell (MFC) consists of two cells which has 15x15x15 cm3 volume. One part of the cell conserves the mud (anode) the other part conserves the water (cathode). The membrane of the microbial fuel cell has 8×8 cm2 area. Two different samples were used in the experiments which are active and settlement mud. The power, volt and current values of the active and settlement mud for different temperature, resistance and bubble were determined. The temperature values consist of ΔT = 8°C, ΔT = 10°C, ΔT = 12°C, ΔT = 14°C. ΔT=Tenvironment- Tmud. For every ΔT value 2 different bubble values were examined (High=21,5 g/h, low=3,5 g/h). For every bubble effect 7 different resistance values were determined (1. Resistance= 3,75 Ω; 2. Resistance =7,5 Ω; 3. Resistance =10,5; 4. Resistance = 14,5 Ω; 5. Resistance = 16 Ω; 6. Resistance = 19 Ω; 7. Resistance = 21,5 Ω) and the performance of the 8×8 cm2 membrane of the MFC is detected. As a result; with the increase of the temperature, resistance and bubble effect the voltage production increases and correspondingly the current decreases. When all the experimental results are evaluated,the highest voltage production (687 mV) occurred at ΔT = 14°C and 21,5 Ω with the high bubble effect in the settlement mud. Also, in this study, MFCs performances in terms of voltage, current, temperature, power was modeled with Rule-Based Mamdani-Type Fuzzy (RBMTF) modeling technique. Input parameters ΔT and time; output parameter power was described by RBMTF if-the rules. 1792 experimental data sets, which obtained for power according to ΔT and time, were used in the training step. The comparison between experimental data and RBMTF is done by using coefficient of multiple determination (R2). The actual values and RBMTF results indicated that RBMTF can be successfully used in MFC. ECAP was conducted using route Bc with an angle of 120° between the die channels and a stepwise decrease of temperature from the initial 425 °C to 300 °C at the final, 12th pass. The cumulative equivalent strain the ECAP billets underwent was about 7.8. The structure examination showed that ultrafine-grained structure with the grain size of 0.69 – 1 μm was formed during ECAP process. In addition, particles of the phase Mg12Nd with an average size of 0.45 μm were formed. The refinement of the microstructure resulted in an improvement of the mechanical properties of the alloy. After ECAP, the strength characteristics of the alloy increased to the levels of ultimate tensile strength of 300 and yield strength of 260 MPa to be compared to those for the initial state (220 MPa and150 MPa, respectively). At the same time, the ductility increased to 13.2 %, which compares favourably with the initial value of 10.5 %. The ECAP process does not affect the resistance to electrochemical corrosion. The rate of chemical corrosion was found to be reduced owing to the ECAP processing. Investigations of wear resistance and tensile strength of steel products with diffusional zinc coating obtained in zinc powders with a nanocrystallized surface of powder particles were carried out. The effect of the structural state of the coating on the wear resistance and adhesive grasping with a steel counterbody was established. The prospects of the nanogalvanizing process to improve the strength of steel products are shown. 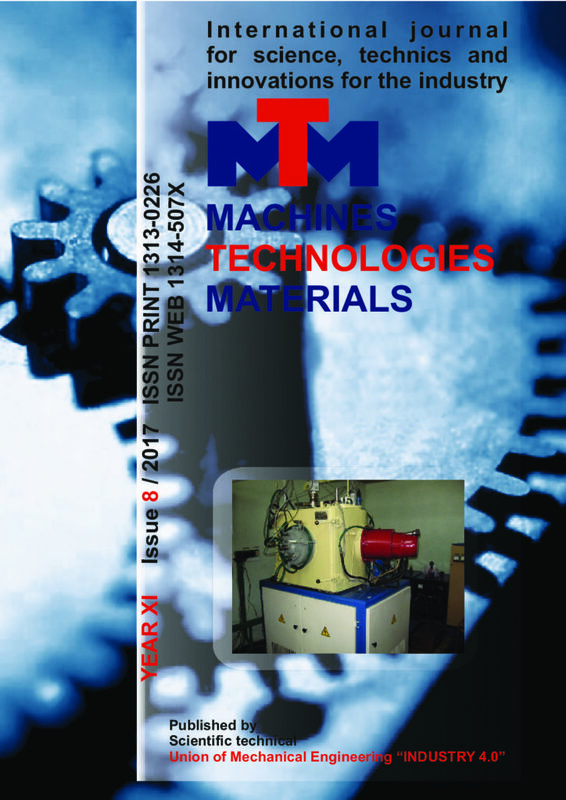 The development of technologies in modern machine building aims at improving the mechanical and technological properties of the materials. The present study presents an improvement in the mechanical properties of low carbon steels by thermoffusion coatings with nanofibers obtained under different heat treatment regimes. Depending on the type of heat treatment and the size of the zinc particles, different gradient layers can be obtained in depth. This of course reflects positively on the chemical resistance of the material. In addition, it positively affects the mechanical properties of the material by increasing mechanical strength and technological properties by improving the resistance to plastic deformation. With these first studies, there is an impetus for another look to improve the properties of low-carbon steels that are widely applicable in the field of machine building. In contrast to the melting technologies for the production of high-temperature alloys in the solid-phase technology developed by us, a multi-layer structure of the future composite material is already set at the initial stage of the billet formation. In the work presented, the billets were assembled from Nb- and Mo-foils with one or two-sided coatings of carbon or Si-B. Layered structures of composites were formed during the diffusion welding of packets at 1500°C and a pressure of ~14 MPa. In the place of the coatings, layers of hightemperature carbides or intermetallic Si and B compounds with Nb and Mo formed, which occupied up to ~40% of the cross-sectional area of the composites. The strength and crack resistance at room temperature, strength at a temperature of up to 1500 °C, as well as the modulus of elasticity and density were measured. The presence of intermetallides in the structure of composites leads to a decrease in their density and an increase in the modulus of elasticity. In this paper, the possibility of creating new structural organoplastics based on aromatic polyamide of phenylone, fiberreinforced sulfone-T, is considered. Analysis of the results of physical and mechanical properties showed that, on the one hand, the introduction of an organic fiber into the polymer matrix leads to an increase in hardness, modulus of elasticity, and Poisson’s ratio of 1.7; 1.9 and 1.3 times, respectively, on the other hand, there is an insignificant increase in the relative strain and yield stress at compression in the range of 10%, which is due to the presence of micropores formed at the polymer-fiber interface in the structure of organoplastics with the introduction of fiber filler over 15 wt.%. An increase in wear resistance of 1.6 times was observed, while a reduction in the coefficient of friction by 60%, compared with pure phenylone. Positive results of the research made it possible to switch to industrial ones – replacement of roller bearings of pins on sliding bearings made of polymeric composite material, which led to an increase of 3-4 times the working life as compared to serial ones.